Longer daylight hours, fewer excuses for living on chocolate, and all the green veg in season: April has landed. The other new thing, as if it being light at 6pm wasn’t enough, is this seasonal eating round-up. We asked on Instagram if it’s something people would be interested in seeing, and the answer was a resounding yes – so here we are! 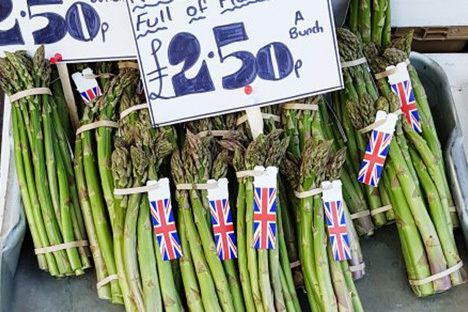 In British food, April brings the switch from forced to field rhubarb, along with the appearance of asparagus. All in all, this month we can expect: spring green cabbage; savoy cabbage; celeriac; cauliflower; kale; leek; parsnip; apples (bramley, braeburn, jonagold, cox, gala, cameo, kanzi, and jazz); and pears (conference). To make the most of that rhubarb with a middle eastern twist, there’s this rhubarb kadaif pie, or you can keep it traditionally British with rhubarb and custard cakes. You can also stay on trend without the price tag by making rhubarb gin at home – or save it for later months in the form of rhubarb curd. It’s the last month with hardy kale for a while, so why not try a bacon, kale, and ricotta sandwich? Or perhaps the Scottish rumbledethumps? Try saying that five times, quickly. And, of course, asparagus. Making their appearance in late April, those sought-after spears take the stage in asparagus quesadilla lasagna and in vegan lemon asparagus risotto. Keep that lemon-and-asparagus marriage going with asparagus, goat cheese and lemon pasta.